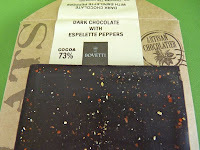 Today was Day #5 of Chocolate and Spicy Pepper Theme Week. This 73% cocoa dark chocolate bar with espelette peppers was not spicy, but the crushed espelette peppers sprinkled on the back of this bar from Bovetti (France) did give it an attractive, festive look. This would be a good bar for eating or for grating, baking, and perhaps even for fondue. However, for those who have become spoiled by the new American maker bars, you may find this dark bar a little flat-flavored. 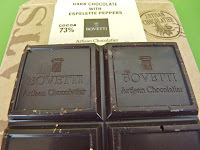 I was convinced I was eating nice dark chocolate (hard snap, smooth consistency), but there was something (flavorings? vanilla? 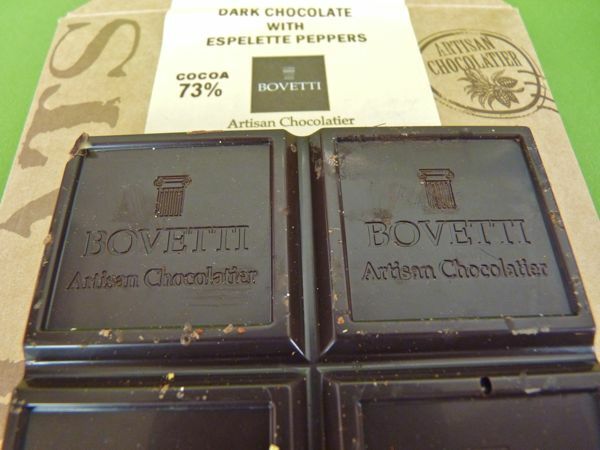 cocoa source? a darker roast time that flattened out acidity?) that was dulling down the flavor arc from the cocoa itself. I've found the same thing in other dark(er) bars from Italy in the last few years. Theories on this phenomenon would be welcome.